Formerly with Playing Mantis, now CEO of Round2, Tom Lowe is the owner of the AMT, Auto World, Hawk, Lindberg, MPC and Polar Light brands. Lowe's company Round2 licensed the rights from TOMY International for the Johnny Lightning brand of diecast cars in 2005. Johnny Lightning first closed in 1971. 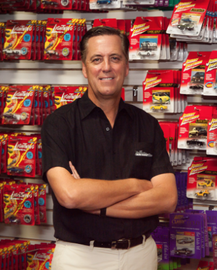 Lowe was part of the Diecast Hall of Fame's Class of 2010 for his entrepreneurial accomplishments in the diecast community.